Interest : Most interesting at 10-20m. Not interesting below 35m. Start the dive at 25m come up to 10-15m. great drift dive, good for two dives. First dive in front of the small rocky island and the second dive before your exit point from the first dive. Reef slopes with many coral heads and soft corals. Also very special on this dive site are the coral strings. Delicate sea whip, School of Napoleon Wrasse. This fish is also called Double-headed Maori Wrasse, Barracudas and Batfish and Manta Ray are seen occasionally. Dive Direction : Start the dive with the slope on the right shoulder. Often a strong drift dive. Monitor you NDL, average depth is deeper than normal. Its underwater shoal with the top at 8m that means you have to make a safety stop in free water, make use of a marker buoy to drift at 5m, 3min for your safety stop. There used to some dynamite fishing, the reef is however slowly recovering. 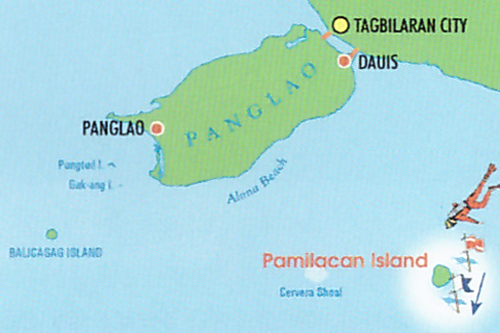 Often this dive site is the second dive in combination with Pamilacan Island. Many Black-Banded Sea snakes, morays like the white-eyed, starry moray eel and Nudibranchs. Small reef fish. Some corals and bucket sponges. The top is teeming with sea urchins, be careful with your buoyancy.